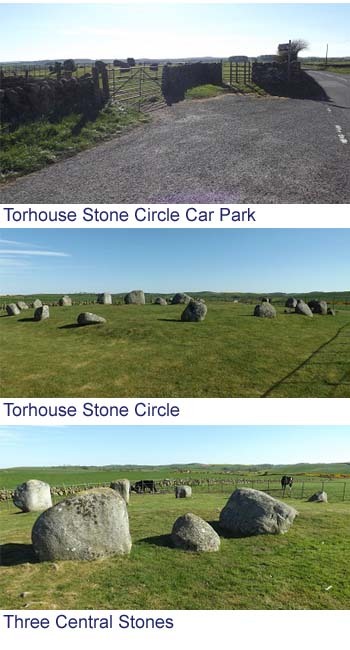 Torhouse Stone Circle is situated in Galloway southwest Scotland, 23 miles east of Stranraer, 57 miles southwest of Dumfries, just off the B733 road, 3 miles west of Wigtown. The stones are free to visit. There is a car park next to the road by the stones, as seen right. Torhouse Stone Circle is situated in the Bladnoch Valley, one of the best preserved monuments in this area that was an important site during prehistory. The 19 stones are in a circle with a line of three boulders in the centre. Records from 1684 state this is King Gauldus Tomb. The stone circle has 19 granite stones about 2ft to 5ft high, arranged in a circle about 70ft in diameter. Three of the largest stones in the centre, are in a northeast to southwest line. There are another two stones 45 yards south-southeast, and a row of three stones 135 yards to the east. The area is known to have remains of several burial cairns, with records showing stones from some were used to build field dykes. This stone circle is thought to date to the Neolithic period or the Bronze Age. They are now cared for by Historic Scotland.